Based on reviews from 23 experts and 16,743 users. 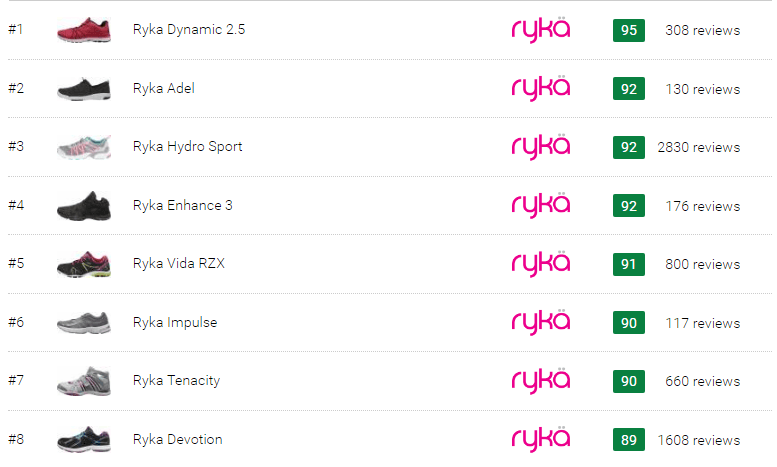 Learn how our rankings work or see our guide to Ryka training shoes. Updated Apr 2019. The philosophy of the Ryka brand revolves around creating athletic footwear specifically for women’s feet. The company has maintained this Made-for-Women mentality for over 30 years since it was established in 1987. Its founder, a woman named Sheri Poe, was disturbed by the lack of quality female sports shoes at that time. She was also disgruntled by the fact that women’s shoes were merely smaller versions of men’s models. It laid the foundation for the brand’s core principle of producing training footwear with a female foot shape, build, and movement in mind. a higher instep volume to accommodate the higher arch of a female foot. Knowing the type of athletic activity that you’ll be putting your footwear through will greatly help you narrow down the choices. Based on this criterion, you can choose between two broad categories: workout shoes and walking shoes. If you are up for an aerobics class, a Jazzercise or Zumba session, a cardio workout, or any other studio exercise, then Ryka workout shoes are the right option for you. 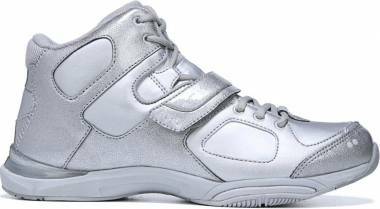 These shoes utilize lightweight and breathable synthetic and mesh materials to keep up with the agility of the above-mentioned activities. They also have a round toe box to allow the toes to splay comfortably inside the shoe. The midsole of these trainers employs proprietary foam materials to provide responsive cushioning and shock attenuation. An Ortholite insole (or similar) is usually added for extra comfort and cushioning as well. 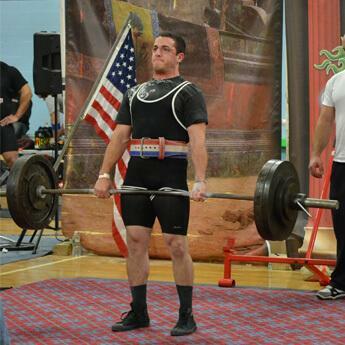 The sole unit has a low-to-the-ground disposition to help the wearer feel in control of the platform and the surface. The rubber outsole of these Ryka training shoes has an ergonomic construction. It also includes a Pivot Point at the ball of the foot to deliver a fine balance of traction and gliding on studio and gym floors. 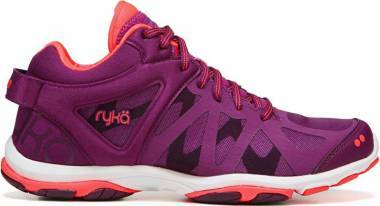 One of the most highly rated shoes in this category is Ryka Dynamic 2.5. If you enjoy taking regular strolls, or strive to hit those 10,000 steps per day, or simply need a comfortable pair of shoes for daily wear, then take a look at Ryka’s walking shoe line. These trainers are meant for extended periods of walking. They also cater to those who prioritize comfort when it comes to doing their job or running errands. This footwear uses streamlined synthetic overlays to support the forward motion of a walking foot. Its toe box is rounded to give the ball and toes some extra room for comfort. A lightweight molded EVA foam is most common for the brand’s walking shoes. It delivers cushioning and guides the foot from heel to toe. Some models include a TPU midfoot shank to stabilize the foot and prevent it from excessive inward rolling (or overpronation). Extra underfoot padding is provided by a Memory Foam insole or an Anatomically-Precise footbed. Even though outsole patterns differ from shoe to shoe, they all employ rubber pods for durability and traction on outdoor surfaces. Flex grooves are also present on each trainer to ensure unhindered flexibility of the foot. 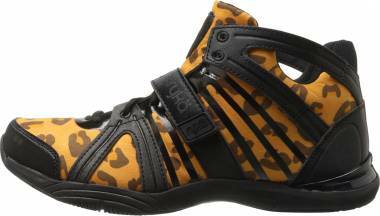 One of the most popular shoes in this array has been the Devotion Plus 2. Ryka training shoes come in a wide range of women’s full and half sizes. Depending on a model, the sizes may vary from US 4 to 12.5. The conversion table for the UK and European sizing schemes is available on the brand’s website. For online buyers who would like to be sure of their size before purchasing the footwear, Ryka offers a free Fit Assistant chart on its official website. Following the instructions, you will be able to find out the accurate size and width of the right trainer for you. Widthwise, Ryka training shoes come in both B - Medium and D - Wide profiles. Based on the brand’s core concept of creating women’s footwear, Ryka trainers are designed close-fitting in the heel and spacious in the toe area. The instep volume is also made bigger to accommodate high arches. Ladies can also choose from shoes with a traditional lace-up closure as well as slip-on trainers. Compared to other leading athletic footwear brands, Ryka offers its training shoes at a rather affordable price. A regular retail price of Ryka training shoes ranges from $60 to $85. It should also be noted that during sales you can get a brand new pair for as low as $20 - $30. You can also keep track of the discounts with the help of RunRepeat.com. Scroll up to the shoe list and click the one you are interested in to see the available deals. 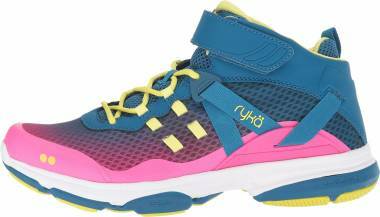 Can I use Ryka training shoes for running? Using Ryka training shoes for regular or long-distance running is not recommended. These shoes are designed with less cushioning than running footgear and do not cater to intensive pounding on outdoor surfaces. It is still possible to use them for short sprints or jogging sessions but, given that it is not their main purpose, this could result in aches in the lower extremities and back as well as in the need to replace the trainer sooner. Which Ryka training shoes are best for Zumba and Jazzercise? Any pair of Ryka workout shoes will be suitable for these dance-based exercises. They are made with a low-profile midsole to afford better proprioception during the fast-paced multi-directional footwork. The rubber outsole on them features an ergonomic design with the Pivot Point on the ball of the foot to accommodate the twists and turns. When should I replace my Ryka training shoes? discomfort or pain in feet, legs, or lower back can also be side effects of the worn-out shoe. Finally, you could also “listen” to what your feet are telling you. If you have a feeling that your pair of Ryka training shoes has lost its initial rebound, support, or comfort, there is a big chance that it’s time to replace it.